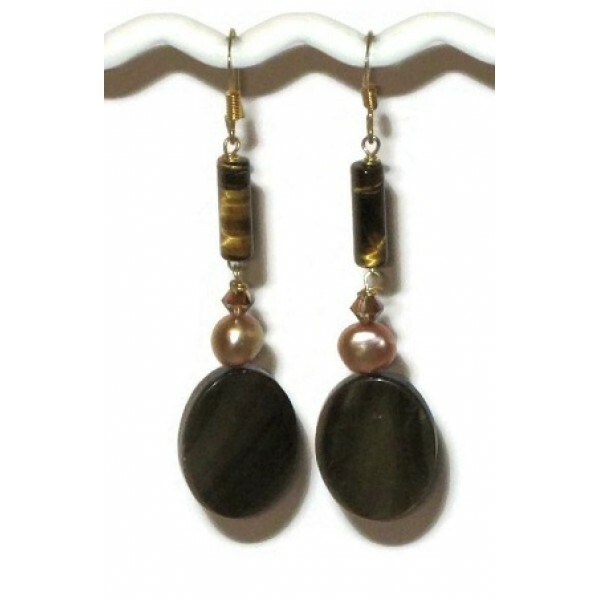 These earrings contain mother-of-pearl beads, freshwater pearls, Swarovski crystals and tiger eye beads. They hang on gold-plated earwires and the full length of the earring is 2 1/2 inches. This necklace is comprised of assorted tiger eye beads and crystals. It is finished with a g..
You can make your outfit more stylish with this bracelet that features faceted and chip tiger eye be.. This bracelet can be perfect for you if you love earthtone colors. It features a striped agat..